If the DVD release of the Six Million Dollar Man TV series—which, after a long and excruciating wait, is finally happening on November 23, exclusively at 6MDM.com—proves nothing else, it’s that George Lucas had it wrong. Our childhood memories do not need improvement. They don’t need extra scenes or better special effects or 3-D conversion. If the creators want to digitally remaster the original tapes, fine, follow your bliss. But don’t fix what’s not broken. Most popular entertainment during the 70s was stupid—the fashion, the music, and especially the science fiction. Star Warswas ridiculous. And so was The Six Million Dollar Man. When you watch the DVD today, it’s amazing to remember that we once considered it all so cool. Even in its better moments, the show is campy and melodramatic. But if you grew up watching and loving the series, it hurts so good; the slow-motion running, the dun-nuh-nuh-nuh-nuh bionic sound effects, the not-so-menacing villains like Maskatron, with his sinister ability to take off his face, and Death Probe, which lumbers at a harrowing pace of several feet every few minutes. There’s so much on this DVD that could’ve been altered or erased from history. Lee Major’s unfortunate pencil-thin mustache from Season Four, for instance. Or that ill-advised Sonny Bono episode. But it’s all here, every staggeringly awesome and wincingly awful moment. Yes, the 40-disc, 100-hour DVD costs a steep $239.95. But it includes the classic “Secret of Bigfoot” episodes, and Andre the Giant hasn’t been replaced with a digitized monstrosity from Industrial Light & Magic. It’s still just a wrestler in a monkey suit doing slow-motion choreography with a man showing maybe a little more chest hair than was necessary. And if that’s not worth your recession dollars, either you weren’t alive in the 1970s or you hate America. Majors called me earlier than expected for our interview. When I picked up the phone and heard that familiar voice say, “Hello, Eric, it’s Lee Majors,” literally the first words out of my mouth were “Holy crap!” I probably would’ve had the same reaction if he’d called on time. Talking to Lee Majors makes about as much sense as talking to Boba Fett. There was a part of me that wanted to remind him, “You know you don’t exist in the real world, right?” But for a guy this iconic, whom many of us remember best as a 13-inch-long action figure with a bionic grip, the now 71-year-old Majors was disarmingly sweet and unpretentious and all too human. 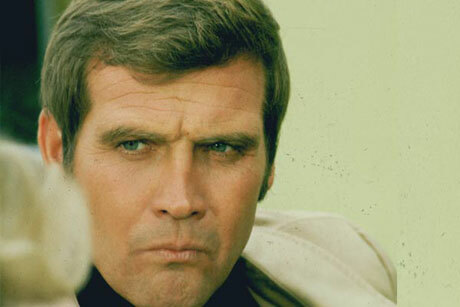 Lee Majors: Sometimes, sure. I never liked doing scenes where I was showing my chest. It was just uncomfortable. It was the same way in The Big Valley. I always felt embarrassed doing that kind of stuff. Right, right. And I fought against it. I was like, “This is ridiculous. He wouldn’t take his shirt off in this scene!” But that’s what sells. The same thing happens to young females. They’re always trying to get them to wear something low-cut. I guess it works both ways. They put me in that red jogging suit because they thought it would draw in female viewers. What happened to that red jogging suit anyway? Is it still in your closet? I have one, but I don’t know how far back it goes. It wouldn’t surprise me if somebody handed one of the original suits to me and asked me to sign it. You can find anything on eBay these days. You ever watch that show with the singing teenagers? Yeah. I’ve seen it once or twice, but I noticed that the lead lady in it wears a red sweatsuit. What’s her name? Yeah, yeah, her. She’s kind of the leader of that whole group. I think maybe she got the idea to wear that red suit from watching The Six Million Dollar Man. It gives her some power. You’ve done the rounds on the sci-fi convention circuit lately. Has it been a merchandizing flashback? It’s definitely been odd. I’ve never gone to any of these conventions in my 47 years in the business. But I started doing a couple recently. I did one in Boston and New York, and I’ll be in Austin this weekend (November 12–14, at the Austin Convention Center). They’re kind of fun, but it’s amazing some of the things people bring out for you to sign. There’s merchandise I never knew existed. Are you still getting checks for toys you never actually saw? Oh no, not at all. I was under contract with Universal, and they gave me a little percentage of the gross. But as far as they were concerned, they’re still in the red. I tried to audit them once, and they said, “Go ahead. Here’s our records.” And sure enough, it says right there that they’re still in the red. They haven’t made a penny. Maybe they were just showing you receipts for the Oscar dolls. I don’t know what it was. They have the best accountants. I want them to do my taxes. What’s the weirdest thing a fan ever asked you to sign? I don’t know. Name something. Uh, the bionic transport and repair station. Oh sure, I’ve done that. I’ve signed lunch boxes and coloring books and records. When I was at the New York Comic Con, this guy and his wife brought in the hood of one of the trucks we used in The Fall Guyand asked me to sign it. Somebody else brought in the glass from a Six Million Dollar Man pinball machine. You know what I’m talking about? The glass on the top of one of those machines? It’s like two feet by four feet, and it’s heavy. They brought it in to the convention center and asked me to sign it. I felt bad for them. This thing was huge, and they had to carry it around all day. Do you own the toy version of yourself? I do have a couple of the dolls. Wait, hold on. You know what? They’re not dolls. They’re action figures. The eight-year-old me thanks you for saying that. Was your action figure anatomically correct? [Long pause.] I’m not sure. It looked like me, if that’s what you’re asking. So you don’t have roll-back elastic skin? How about a hole in the back of your head? You mean on me or the doll? I honestly don’t remember. I know for a fact there was a head hole on the doll. Whoa, whoa, whoa! It’s not a doll. There you go again. Sorry, sorry. The action figure. Thank you. I don’t want to give anybody the wrong idea. Back in the 70s, I was a member of the Six Million Dollar Man Bionic Action Club. Do you remember that? I sent in 50 cents and got a membership card and certificate. I also got an autographed picture of Colonial Steve Austin. Was that actually signed by you, or was I ripped off? We only did that for a year or so, during the middle of the show. I had a fellow who helped me with that, but I signed most of them. I can guarantee it. Good lord, man. You really are a machine. I think it’s only fair to the fans. So many people rip you off these days. I go on eBay and somebody is selling Six Million Dollar Man T-shirts with my picture on it, and there’s nothing I can do about it. I told my wife, we should just print up a bunch of these things and sell ’em ourselves. What’s the target demographic for the Six Million Dollar Man DVD? Who’s buying this thing? Is it just middle-aged guys who grew up loving the show, or are you hoping to attract new bionic fans? Well, I think the old fans are always going to be there. But I’m excited to share it with a younger generation, because I think it’s a great family show. There was no blood or violence, which you see in so many TV shows today. Do you remember when they tried to remake the Bionic Woman a few years ago? Did you see it? Nope. If it didn’t have Lindsay Wagner, I wasn’t interested. I couldn’t watch it. It was just too dark. And the girl in it wasn’t very likable. Our show was more homespun, I think. Whenever Steve fought some bad guys, nobody ever got shot. And after a fight, we’d always show the villains rolling over or getting up. Nobody was left for dead. It was just a great show for kids. You know why I think the updated Bionic Woman show didn’t work? No dun-nuh-nuh-nuh-nuh sound effects. [Laughs.] I guess that’s one explanation. When you did a bionic fight scene, was that sound constantly going through your head? Were you always thinking, Dun-nuh-nuh-nuh-nuh? No, no, no. I didn’t even like it. Oh come on, Lee. You’re breaking my heart. Just do it for me once. You know you want to. Dun-nuh-nuh-nuh-nuh. So they lied to you? Well, no, not right away. We did a made-for-TV movie, which was pretty good. And then we made two more movies in 1973, but it got too gimmicky and stylistic. It had too much of a James Bond spy tone to it. When they finally decided to do a series, I said, “O.K., I’ll do this. But I want to play down the bionics. I want to make him as human as possible.” And that’s what we did. And then a few seasons later, you’re having slow-motion fights with Andre the Giant in a Bigfoot costume. [Laughs.] That’s right, yeah. Everybody brings up Bigfoot. No, no. Not at all. It was a great part of the show. And I loved working with Andre. He was really a gentle giant. Such a sweetheart. I remember doing a fight with him, he’d pick me up and throw me like 10 yards. And then he was supposed to come after me, jump up in the air, and land right on top of me. Didn’t he weigh something like 500 pounds? I think so. I distinctly remember laying there on the ground and I’ve got the sun in my eyes. I know he’s running towards me but I can’t see anything. And then this big cloud appears over me, just blocks out the sun, and I know it’s him crashing down on me. I flinch, waiting for the crush. But you know what? The guy never touched me. It looked so realistic on the show, but I didn’t feel a thing. That’s what you get with a professional wrestler. He knew what he was doing. It takes more talent to jump on somebody without hurting them than it does to actually break their ribs. Do you think The Six Million Dollar Manpredicted the future of cyborg technology? I do, yes. It’s one of the things I’m most proud of. Prosthetic arms and legs and even bionic eyes have become commonplace. They have the technology now for the wounded warriors that come back from service. They’re able to put these kids back together. And a lot of those ideas originated with The Six Million Dollar Man. That’s the best thing that ever came out of that show. Have we made any advances in Death Probes? Death Probes. Do you think they were the inspiration for Roombas? I have no idea. But it’s funny you should mention robots. When I was at the New York Comic Con, there was . . . you know those little robots? D2 something, whatever the heck it was. The little white robot thing? Like in the Star Wars? Moves along making “beep-bop” robot sounds? Yeah, O.K. I get you. Droids. Whatever they call it. I’ve never been into that Trekkie stuff. Anyway, I was at my booth, and this guy had designed a robot that played the theme song from The Fall Guy. I didn’t even know where it was coming from at first. And then I looked down at the floor and there’s this robot playing my song. Yeah, that’s it. I thought it was pretty funny. The last time we saw Steve Austin and Jaime Sommers, they were getting married in the 1994 TV movie Bionic Ever After. We all know that Hollywood marriages never last, so I hesitate to ask this but . . . are they still together? I wouldn’t think so. If we ever do another reunion move, it’ll be called The Bionic Divorce. Are you serious? That’s horrible! Why couldn’t they make it work? I don’t know. Maybe I’m wrong. Maybe they’re both still together and living in some bionic old-age home. They could be perfectly happy. I don’t know if the romance is still going strong. At their age, their parts are probably rusting.